Hey, Putin, Have You Seen How Much China Is Investing In Ukraine? KIEV, Ukraine -- On July 6, the Financial Times reported that Ukraine has become the largest corn exporter to China, surpassing the United States. This was surprising, as America has historically possessed a near-monopoly on corn exports to China. Ukraine’s increased role in providing food for China also extends beyond corn. Since the 2014 Russian annexation of Crimea, Ukraine has increased its agricultural trade with China by 56 percent. On the one hand, China has not explicitly condemned Russian aggression in Ukraine. It has even tacitly rewarded Russia for its anti-Western defiance by buying more Russian oil and gas, though it has balanced those purchases with the expansion of energy contracts with Central Asia. On the other hand, China has helped keep Ukraine’s war-ravaged economy afloat with investment and trade. Chinese capital has contributed greatly to the revival of Ukraine’s once-formidable agricultural sector. Deeper analysis of China’s contradictory Ukraine policy makes it clear that China’s strategy in the post-Soviet region is to remain pragmatically non-aligned. China recognizes the benefits of balancing its trade linkages with Russia and Ukraine, and is keen to embrace lower-cost imports from Ukraine’s crisis-ridden economy. The fact that China is keeping its diplomatic and economic strategies separate means that Ukraine can pivot towards China to help rebuild itself economically from the ashes of war. Chinese capital can facilitate the expansion of Ukraine’s growth industries like information technology and real estate construction, in addition to making China a reliable new market for Ukraine’s agricultural exports. Ukraine’s pivot to China could also ease its long-term economic dependence on Russia. Even though the countries are at war, Russia remains Ukraine’s largest single trade partner. Increased Sino-Ukrainian economic cooperation could also compensate for the West’s reluctance to offer Ukraine large-scale economic assistance. The conventional wisdom that the Ukraine conflict has caused Russia and China to collude against the West is flawed. Rather, Ukraine has become a site of economic competition between both great powers instead of a basis for sustained strategic cooperation. To explain this, I will provide historical context for Ukraine’s rebalance towards China and extend my analysis from the FT’s “corn diplomacy” argument to include real estate, information technology and defense contracts. A brief history of ties between China and Ukraine Ukraine’s increased economic linkages with China began long before the 2014 Russian annexation of Crimea. It started during Viktor Yushchenko’s presidency (2004-2010), a period that has often been described as the high-water mark for Ukraine’s ambitions for European integration. In 2009, China provided aid for medical assistance devices during the flu pandemic and proposed infrastructure projects like Kiev’s orbital road and bridge building over the Dnipro River. China’s expansion of economic ties to Ukraine occurred right after the 2008 financial crisis, which caused a 15 percent GDP decline and 16.4 percent inflation in 2009. That may seem counterintuitive, but the rationale for this policy was two-fold. First, the collapse of the Ukrainian steel industry during the 2008 financial crisis made it clear that the country had to return to its traditionally dominant export, agricultural products. Simultaneously, increased Chinese demand for food brought that country closer to Ukraine. Second, both Russia and the West were unwilling to provide economic assistance for Ukraine, which gave China an unprecedented opportunity to gain economic leverage over Ukraine. This expanded influence ensured that Ukraine would be a useful actor on the Western fringe of China’s New Silk Road grand design that aims to increase China’s geopolitical power by linking Eurasia economically to South Asia and the Pacific region. By the time Viktor Yanukovych gained power in 2010, Ukraine had become a theater of the Russia-China Great Game in Eurasia. Yanukovych’s emphasis on closer relations with Russia initially complicated China’s diplomatic overtures towards Ukraine. Nevertheless, China declared a Sino-Ukrainian strategic partnership in 2011, expanding its investment in infrastructure projects like the Kiev airport railway scheme. The Diplomat’s Shannon Tiezzi reported in 2013 that China’s bilateral trade ties with Ukraine declined by 0.5 percent from 2011 to 2012, in contrast to the 36 percent annual growth recorded during Yushchenko’s presidency. Ukraine’s economic collapse and soaring debt levels in the wake of Russia’s annexation of Crimea suggested that China-Ukraine trade relations were entering a nadir. That pessimistic view was wrong. Popular protests brought down Yanukovych, who fled to Russia, triggering the Russian invasion of Crimea and the current standoff. The outbreak of war brought in a new Ukrainian president, Petro Poroshenko, who supported closer relations with the EU and China to counter Russian aggression. As a result, China gained the upper hand in the Great Game for Ukraine. Even before the Maidan protests broke out in November 2013, China had declared its intention to rent and farm 5 percent of Ukraine’s land. After Russia invaded Crimea, Ukraine steadily increased the scope of its agricultural deals with China. China also invested significantly in other sectors. In March 2015, China lent Ukraine $15 billion over 15 years, for housing construction to revive Ukraine’s collapsing real estate market. Chinese economic ties to Ukraine have also deepened in the aeronautics industry. On July 8, 2015, a first-ever China-Ukraine forum on science and technology was announced confirming that China would facilitate the expansion of Ukraine’s information technology sector, a crucial growth industry for Ukraine’s cash-strapped economy. Is Chinese investment good or bad for the Ukrainians? China’s increased investment in the Ukrainian economy has been praised by many Kiev business elites. Oleg Prokhorenko, CEO of UkrGasVydobuvanya gas company, told me in a recent interview that future Chinese investment in Ukraine could resemble China’s deepened economic cooperation with Belarus. In Belarus, China has underwritten five major projects, ranging from hydrocarbon plants to an industrial park. Other Kiev business leaders have been more pessimistic about the likely scope of Chinese investment, due to Ukraine’s lingering economic instability. 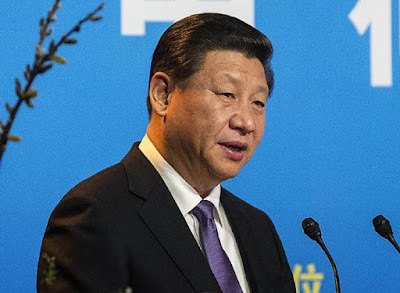 Poroshenko’s controversial de-communization legislation, which banned communist symbols and drew attention to communist atrocities, has also been cited as a decision that could compromise future cooperation between Ukraine and China. China’s recent stock market crash also alarmed Ukrainian investors and has raised questions about the long-term stability of the Chinese economy. Despite these problems, Ukraine’s private sector is poised to enter a death spiral if it does not continue to consolidate its business links with China. Interestingly enough, the Sino-Ukrainian private sector and civilian industry ties have not been matched by enhanced bilateral cooperation in the military sector. As recently as 2012, Ukraine was the world’s fourth largest arms exporter. Since its 1989 military suppression of protests in Tiananmen Square, China has been subject to a Western arms embargo, and consequently it was a major purchaser of Ukrainian military hardware. The war has transformed the Ukraine-China arms trade balance, however. Ukraine would now greatly benefit from access to Chinese military technology. Since the U.S. and the EU have not provided Ukraine with lethal arms shipments, Poroshenko would undoubtedly covet an agriculture-for-arms pact with China. A pact of this kind is especially appealing as China can be seen as an impartial “third option” trade partner. Ukrainian policymakers do not see Chinese economic linkages to be infringing on Ukrainian sovereignty in the way closer ties to either the EU or Russia would. But hopes for such an arrangement have been dashed by a drastic transformation in the dynamics of the China-Ukraine-Russia strategic triangle. In 2012, when Yanukovych announced the formulation of a tripartite agreement with Russia and China encompassing railroad transit and pipeline material export projects, Ukraine was the country that could decide the extent to which it traded with China relative to Russia. Now, China is the fulcrum, as both Russia and Ukraine depend on Chinese capital. Any cooperation between China and Ukraine will be conducted on Chinese terms. That means China will invest economically in but will not sell military equipment to Ukraine, because that would antagonize Russia and compromise Sino-Russian gas contracts. In short, China’s balancing act between Ukraine and Russia is highly complicated, and Western policymakers overlook China’s stake in Ukraine at their peril.